Picture a map of the world color-coded to represent not countries, but altitude. In North America, Appalachia would be a long, topographical peninsula between the densely settled Eastern Seaboard and the fertile plains of the Midwest. In South America, the western population centers would be an elevated archipelago above malarial lowlands; in Northern Europe, the Benelux plains and polders would be difficult to discern from the North Sea. And in southern Asia, stretching from the Vietnamese highlands up into the Tibetan plateau and as far west as Afghanistan, would be a single sprawling mountain realm that is home to more than 100 million people. This is Zomia. Zomia is a rugged swath of Asia that for 2,000 years has remained culturally aloof from the traditional centers of power and the pull of empires. Its inhabitants, Asia’s “hill people,” have earned a reputation for egalitarianism, insurrection, and independence. Up until the second half of the 20th century, many of the societies there remained nonliterate and supported themselves through trade, smuggling, and Iron-Age practices like slash-and-burn agriculture. a far more ambitious argument: Zomia, he says, offers a sort of counter-history of the evolution of human civilization. What Zomia presents, Scott argues in his book “The Art of Not Being Governed,” is nothing less than a refutation of the traditional narrative of steady civilizational progress, in which human life has improved as societies have grown larger and more complex. Instead, for many people through history, Scott argues, civilized life has been a burden and a menace. “The reason why some people didn’t become civilized, why some people didn’t ‘develop,’ may not be a question of them not having the talent, or being backward and so on, but may be historically produced by their desire to avoid what they saw as the inconveniences of states,” says Scott. Scott’s anarchist history of Zomia is controversial, both in its claims about the predatory nature of the state and in its portrait of Zomia’s past. Other scholars of Asia - and Southeast Asia in particular - charge him with overgeneralizing about the region, and with seeing political motives in decisions and traditions that in fact have their roots in ecological necessity, happenstance, or even the profit motive. But Scott, and other scholars of Zomia, are also pressing for a change in how we see the political world. In looking beyond national borders, or politically defined regions like East Asia or Southeast Asia, and in applying different kinds of organizational logic - in other words, in thinking of areas like Zomia as places in themselves - they see a chance not only to paint a more coherent portrait of history, but also to better address the troublesome and sometimes violent politics that can erupt in what are traditionally seen as the world’s marginal border regions. The image of Asia has been shaped by its great empires: the Han and Tang dynasties of China, the Gupta Empire and the Mughals in South Asia, the Thai and Malay city-states. These civilizations grew up on coasts or in fertile river valleys, the largest engulfing vast stretches of territory and leaving behind rich historical records in everything from tombs and temples to treatises and household goods. Their cultures still dominate the identities of the countries where their descendents live. All this, however, is lowland history. Zomia is an alternate world, a realm of mutable, outlaw cultures, creating almost no empires and resisting being incorporated into those that originated elsewhere. Its people include the Hmong, the Wa, the Karen, the Lahu, and the PaO. Its exact borders are up for debate: Scott’s definition of Zomia is smaller than some, stretching from Vietnam up into China, but west only as far as northeast India, covering a region traditionally known as the Southeast Asian massif. The defining characteristic of this expanse of thickly wooded hills and mountains is what Scott calls “friction of terrain.” Travel is arduous and inhabitants are difficult to dislodge or discipline from below. In Zomia, elevation not only compounds distance but supersedes it, so that people living several hundred miles apart but at the same altitude can have nearly identical cultures - but little in common with neighbors who live lower or higher in the hills. The 20th century, with its arsenal of distance-devouring technologies from the airplane to the Internet, has made it easier for states to smooth the friction of landscape, and recent decades have also seen a determined campaign among Asian states to bring their highland regions into the fold, often by settling them with lowland people more loyal to the national government. As a result, since World War II, Zomia has lost much of its distinctive wildness. But there are still pockets of fierce resistance. In the mountains along the Myanmar-China border, for example, the Wa have carved out what is essentially their own unofficial narco-state, funded by poppy production and heroin smuggling and protected by a well-equipped 20,000-strong army. The best known of the Zomian populations, at least in the United States, is the Hmong, many of whom fought alongside the United States against the North Vietnamese and Laotian communists in the Vietnam War. More than any other highland people, the Hmong define themselves in opposition to the ethnic Han of China, against whom they have risen up in rebellion, on a regular basis, for millennia. The crackdowns that follow these sometimes massive rebellions - and, most recently, the crackdown that followed the communist victory in the Vietnam War - have driven the Hmong farther and farther into the hills, and today several million live in the massif, mostly in China and often at elevations above 3,000 feet. Other peoples, like the Karen on the Myanmar-Thailand border, have a similar history of revolt against lowland governments - inspired, in many instances, by charismatic prophets - followed by suppression and retreat into the highlands. The cultures that have emerged have tended to be fiercely nonhierarchical. The Wa, for example, limit ostentatious feast-throwing and forbid the wealthy from conducting sacrifices that might be seen as giving them chief-like status. The Kachin have a long tradition of killing chiefs who are seen as overreaching. 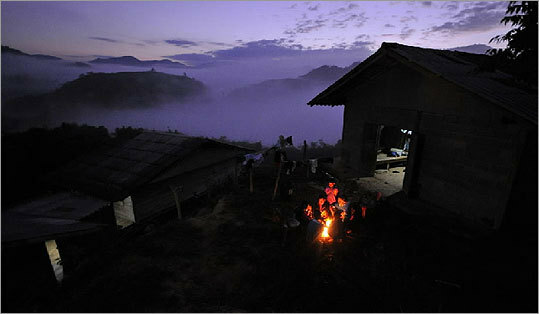 The Lahu, of China’s Yunnan province, have no level of political organization above the hamlet. All of these traditions actively prevent a larger, more complex society from emerging. The antistate orientation of these societies extends, in Scott’s description, even into the sort of agriculture they practice. Slash-and-burn, or “swidden,” agriculture - clearing patches of woodland for crops and moving on after each harvest to allow the soil to replenish itself - is usually seen as a crude antecedent to the more intensive farming practiced in the lowlands and most of the developed world. But swiddening and other forms of itinerant agriculture, Scott argues (borrowing from the work of the mid-20th-century French anthropologist Pierre Clastres), are often adopted in preference to fixed agriculture, by people who know how to do both. The reason, Scott says, is that swiddening provides a freedom that fixed agriculture does not. Not being tied down to one laboriously cultivated piece of land, farmers can pick up and move on if they find political conditions onerous. In his most speculative and contested claim, Scott argues that even the lack of a written language in many Zomian societies is an adaptive measure and a conscious societal choice. For peasants, writing was, first and foremost, a tool of state control - it was the instrument the elite used to extract money, labor, and military service from them. As a result, Scott argues, when those peasants escaped into the hills they discarded writing in an attempt to ensure that similar coercive hierarchies didn’t arise in the new societies they formed. Scott’s book has the potential to gain a readership far beyond the world of Southeast Asian studies. But among others with an intimate knowledge of the part of the world he writes about, he has come in for criticisms for intellectual overreach. Scott’s anarchist-tinged view of the state’s relationship to outlying populations, for example, has been contested by anthropologists who study the people of the Southeast Asian highlands. In reality, several scholars argue, the relationship isn’t simply one of appropriation, but a more complex mix of mutual suspicion and reliance. For many Zomians, the lowland state is not just an oppressor, but a source - often capricious - of goods and services and even protection. And where Scott sees splintering and flight, anthropologists see the same sort of motivation that lured settlers into the American West: the prospect of available land and economic improvement. And that, more than political rebellion and evasion, also shapes the sort of crops they grow and how they grow them. Scott offers rebuttals to the specific critiques leveled against him - for example, he argues that, since profitable fixed agriculture is possible in the highlands, then other, more political factors must be driving so many people there to swidden agriculture. And the beneficent welfare state that Johnsson describes, Scott points out, is a relatively recent invention. Scott cheerfully concedes, though, the possibility that he may have overgeneralized in the pursuit of a cohesive argument. What the inhabitants of Zomia, in all their diversity, broadly show, he argues, is that given sanctuary by geography, people can prove as eager to reject the basic tenets of civilization as to embrace them, and that the communities that result aren’t necessarily caldrons of savagery and chaos. “I would be tickled pink if people wanted to work this out and say where it fit and where it didn’t fit,” he says, not only in Southeast Asia, but all over the world. In history and political science, much recent scholarship has sought out new vantage points from which to see modern society and its roots - looking at politics from the point of view of the disenfranchised, for example, rather than generals and political leaders. But what Scott is doing is something more radical. He’s arguing that we need to look past our notion that civilization itself represents a desirable goal, and realize that for centuries, people living in a huge part of the world took a look at what civilized society had to offer and passed. Scott is not suggesting that we chuck society and head for the hills. He believes there’s much that the modern welfare state offers that makes our lives demonstrably better. Asked whether he considers himself an anarchist, he says it’s something he hasn’t entirely figured out - his next book will be a collection of essays on the question. Still, for the majority of the world’s inhabitants who will never know life outside of a large organized state, it’s important to keep in mind, he says, that there’s nothing inherently natural about the way the modern state emerged or the shape it took. And it’s not just starry-eyed hippies and kibbutzim who have asserted otherwise. Nor are national boundaries always the most helpful way of framing the world. Zomia offers a fresh and, Scott would argue, more logical way of looking at much of Asia - a part of the world that, despite its importance on the global stage, remains politically and culturally opaque to many in the West. The seeming lawlessness along the borders of Southeast Asia, the restiveness in Tibet and other Chinese provinces aren’t isolated disturbances, he suggests, but rather part of the larger, centuries-long clash between Zomia and its many neighbors. And through that contentious history, Zomia has exerted its own influence. Scott asks whether we can fully comprehend China’s magnificent cultural history or its patriarchal Confucian traditions without an understanding of the highland “barbarians” long at its borders, doggedly refusing the blandishments of civilization. Just as the anti-authoritarianism of the Hmong and the Wa only makes sense in the context of their long struggle with lowland power, so it is hard to understand the Asian giants of today without acknowledging the fugitive spirit of Zomia lurking in their hills.